Can I use two or more languages for readers to choose while viewing my flash book? My readers come from different countries, China, U.S., German, France, etc, and many of them just know their own language, so can I use multiple languages to meet their needs? Try A-PDF to Flipbook (free download here) or other flip book software that support multiple languages. 3. On the left setting panel, "Language-->Switchable", choose "Yes" and apply change. 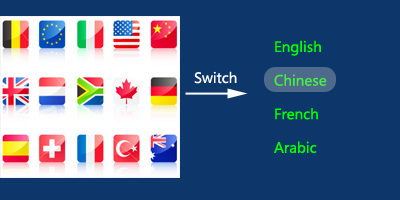 After all these settings are done, your readers can switch to the language they prefer by click the "Switch Language" button.